Illustrator Steven Hughes, a progenitor of the "bad girl" school of comic book art and one of the most successful African-American artists in American comics history, died February 18, according to an announcement from publisher Chaos! Comics. The cause of death was believed to be complications from a long-term cancer-related illness. Hughes grew up a comics fan during the 1950s. As a harbinger of things to come with his own horror comics, the young Boston, Massachussets native devoured work from classic EC-style illustrators like Wally Wood and the Charlton line-up of artists such Tom Sutton, Steve Ditko, Pat Boyette and Pete Morisi. Hughes worked several art-related jobs before getting into comics. He painted portraits, was a mural artist, and a medical illustrator. Before his first comics submission, he was employed as the director of food services and cleaning at a public marine office. That 11-page submission to a variety of independent comics led to an assignment from Aircel Comics, which quickly blossomed into regular work for an ongoing series, Stark Future. He then did comics work for the now-defunct Blue Collar Press. The artist met his best-known collaborator, writer and publisher Brian Pulido, through an ad in the Comics Buyer's Guide. Meeting in Hughes home, the two worked on initial sketchwork by Pulido and Eric Mache to develop the visual style for the characters that would eventually become the foundation of the Chaos! line. 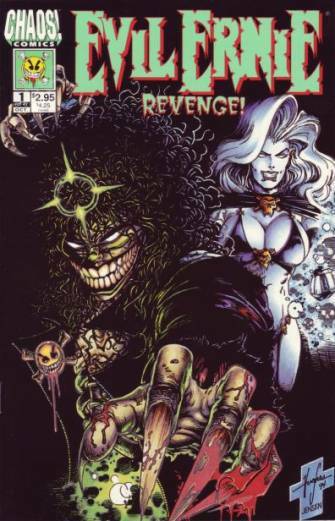 Evil Ernie, the character second-most identified with Hughes, initially appeared in a mini-series from the Malibu Comics imprint Eternity. 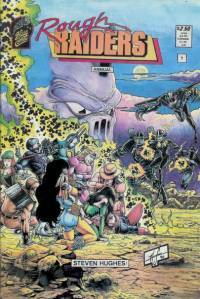 After the mini-series, Pulido and Hughes started their own company with Evil Ernie as its foundation, as further publishing deals meant signing over some rights to the character. Their first comic, Evil Ernie: Youth Gone Wild, appeared in December 1991. As someone involved from the beginning at the newly formed company, Chaos!, and as the person who became its most successful "name" artist, Hughes was long acknowledged as one of the company's founding fathers. The pinnacle of Hughes' career came in 1995, after a hugely successful run on various Chaos! 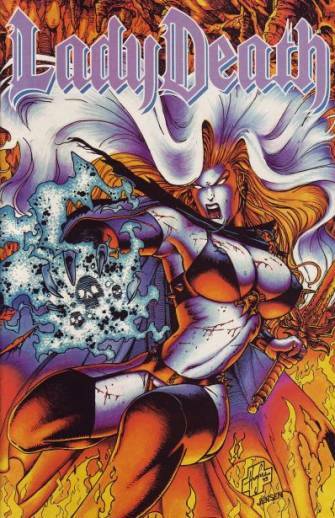 Comics, most notably those featuring his signature character Lady Death such as the best-selling Lady Death #1 and Lady Death: Between Heaven and Hell. In a period marked by the steady decline in the sales of standard superhero comics available from the Big Three publisher, the Chaos! approach as exemplified by Hughes work, mixing horror elements with superhero imagery and the female form, was one of the industry's few strong sellers. Hughes was also a very productive artist, at his peak completing an average of a page a day, both pencils and inks, on Lady Death and the superhero series Detonator. On the strength of the sales of his comics, and as an acknowledgment of the impact his heavy blacks and approach to form had on art styles at that time, Hughes was named to fan magazine Wizard's "Top Ten" artist list, and contributed a cover to the magazine's 75th issue. He also contributed to outside jobs, such as work for Harris' Vampirella. Many of the memorials available on the Chaos! web site immediately upon his passing spoke to Hughes' popularity with comics fans, many of whom he met through an aggressive schedule of comics convention appearances during which Hughes would spend long hours signing for all-comers. In the mid-1990s, at the height of Hughes' popularity, a Perlman-besieged Marvel lessened its presence at the Chicago Comicon, making Hughes and Chaos! one of that convention's main attractions. Slightly older than most of the Chaos! contributors, with a wife and children, Hughes took special care to encourage younger artists. Hughes had also in recent years began to receive notice as one of the few popular black cartoonists working in American comic books. His work joined a tour of mainstream African-American comic book artists in 1995, called The Next Step, beginning with a stop at the Museum of the National Center of Afro-American Artists in Boston. In 1999, Hughes made a personal appearance to support a show at the Words and Pictures Museum in Northampton, Massachussetts in which his work was featured. Hughes demonstrated illustration techniques, and provided sketeches for attendees. That public appearance, and one later that year in Chicago at Wizard World where a fan noticed Hughes signing while receiving fluids thorugh an IV, were rare as he struggled with the first signs of illness. Dealing with the sickness made Hughes less productive, and eventually the illustrator left comics for a short time. His most recent return came in the Fall of '99, when it was announced a healthy Hughes would illustrate Evil Ernie on a cover of comic available to attendees of Chaos! Comics' "Fiend Bash," a Halloween convention in Phoenix, appropriate because of the flood of fan support he received during his sabbatical. Steven Hughes is survived by a wife, Barbara, and three children: Amber, Chance, and Samantha.